Greetings from the Las Vegas airport! I am just hanging out waiting to board the "red-eye" home to the Midwest! I've spent three days with some of my favorite blogging buddies, and am just trying to wrap my head around all of the great things I learned and my heart around the wonderful people I met! The ladies who make up this group of collaborative bloggers helped me feel "found" when I was often physically and emotionally "lost" in the crowded maze of this year's TpT conference. It was all overwhelming and exhausting for me at first, and I they just let me follow where they led, pull up a chair and join them for a meal, bounce ideas back and forth, and laughed with me when I wanted to cry. They truly welcomed me into their "tribe," and for that I will be forever grateful! I will save specifics about my experience for another day and another post, but just really wanted to send a shout out to the creative forces that make Classroom Tested Resource a very special site! That's what my new second graders will be asking when our new school year begins together. Over the years, I have learned that the following barrage from curious children can be exhausting. Where should I put my lunch? Can I use my brand new Elmer's glue today? What bus number do I ride? How does my bus driver know where I live? What if I need to go to the bathroom? Where IS the bathroom? What if someone is mean to me on the playground? What if I don't like my hot lunch from the cafeteria? self-manage, be responsible, and become independent. This year though, I am implementing three new visual displays and activities as well. "IT WILL SAVE YOUR SANITY!" Cardstock, ribbon, magnet tape, and clothespins are the what you'll need to create this visual tool and organizer to help your students let you know what their personal plan is for after school! Be sure to head over to Stephanie McConnell's TpT store to download this fabulous FREEBIE and leave feedback! HOW DO YOU GET HOME CHART? will help you help your students ask--and get answers to--all of the questions bouncing around their heads during those first days and weeks of school. Model problem-solving skills, and honor what they are wondering about by taking the time to listen to their fears, ease their anxieties, and provide patient answers. A fun way to supplement your demonstrations and lessons on procedures and routines is to incorporate stories whose characters have to deal with the same back-to-school anxieties that your students do. The following books and stuffed buddies are just a few of the favorites I share every year when social skills need to be modeled, discussed, and modeled some more! Helen Lester and Lynn Munsinger are the dynamic author/illustrator duo who created Me First and Hooway for Wodney Wat. Both books address the issue of bullying and selfish behavior with humor and empathy, and teach important lessons about respect, patience, and tolerance. Kevin Henkes' books are always featured first in my August author study unit. Wemberly Worried and Lily's Purple Plastic Purse are two wonderful stories about little girls with big problems, and address the issues of anxiety and impatience honestly and realistically. I NEED TO DE-COMPRESS AND SLEEP! Understand that your continued readership and support are truly appreciated, and I look forward to any comments or ideas you have to share! As always, thank you for sharing my story! Continue to teach your children well! 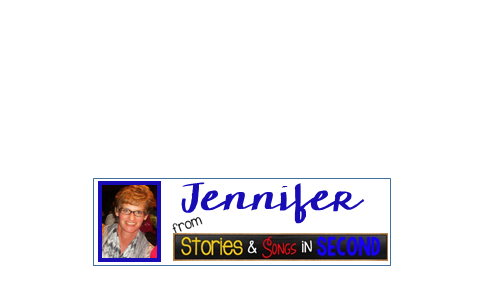 Jennifer I enjoyed reading your post!!! I also downloaded the question board freebie--great idea!! Look forward to meeting up with you again! !